As a very Southern boy, ‘Up There’ is exactly how I’ve always viewed the North-East. During my lifetime, the region’s biggest football clubs have yo-yoed between spectacular near misses and equally spectacular declines, with an ardent fan base the only real constant. This season, Middlesbrough are favourites for Premier League promotion, while Newcastle lost manager Alan Pardew to a team eight places below them in the table, and Sunderland have now sacked Gus Poyet after just one win in twelve games. It seems there’s never a dull day along the Tyne, Wear and Tees. Where Clavane wove race, religion and literature into each era in turn, Walker chooses to set the social scene in one go, with first section ‘The Culture’. 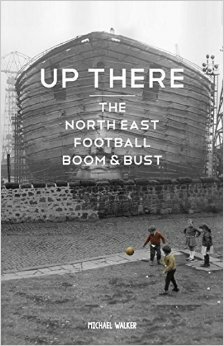 From the golden years of the early 1900s to the often grim reality of today, the North-Eastern decay is depicted in detail on several, inter-connected levels: money, jobs, community; the decline of coal mining, the decline of shipbuilding, the decline of local football. With this backdrop established, that latter theme becomes the focus, as Up There takes a footballing journey from Bob Paisley through to Mike Ashley. Childhood neighbours turned arch rivals, Brian Clough and Don Revie; the Charlton brothers, perhaps the most famous Geordies to fly the nest; and, of course, Alan Shearer’s second coming on Tyneside. The thread that links these three narratives, and many more according to Walker, is exodus – talent born in the North-East, but sadly most successful elsewhere. The later, modern sections are brilliantly and succinctly done. In around 20 pages, Walker tells the exhilarating story of Middlesbrough’s last 20 years, from Juninho all the way to Aitor Karanka. Conversations are used as key structural devices – the words of Newcastle’s Rob Lee and Sunderland’s Niall Quinn work very well as pivots for the highs and lows that surround them. Up There even manages to cover the lower tiers, with chapters on Hartlepool, Gateshead, Darlington and the Northern League. Carefully researched and thoughtfully structured, Up There is also very well-written. Walker is highly skilled at combining the best aspects of short-form journalism (anecdotal details, insightful interviews, concise scene-setting) with a more literary eloquence. ‘If there is a constant down all the years at Newcastle, it is the milking of devotion’, Walker argues at one point. Later on, he describes Quinn as ‘a worried man. Wearside had a few of them, its talking wounded.’ The style feels perfectly suited to the subject matter, a rather bleak kind of beauty. With writing like this, perhaps the North-East won’t always be quite so ‘overlooked’.